Gorgeous old world style glamorous black beaded earrings. These beautiful hand beaded earrings are just perfect for a night out or dressy occasion. Classic elegant style with a finely beaded drop down to a Swarovski crystal embellished beaded ball. Original, beautiful and finely handcrafted. Length from the top of the ear wire is 4.5 cm (1.75″). The beaded ball is 1.5 cm x 2 cm. The ear wires are sterling silver. The hand beading is done with tiny black glass beads and Swarovski crystals. Carefree, summer style. 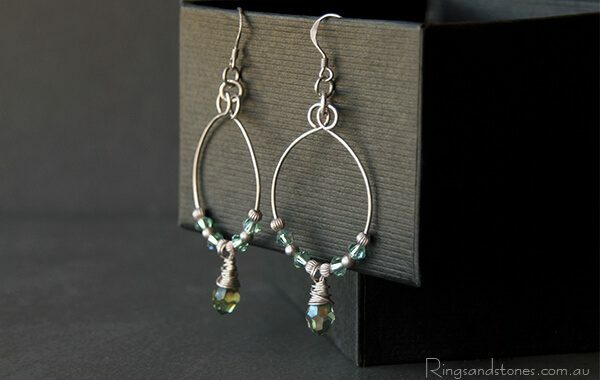 Bright sterling silver teamed with magic green blue crystals. Embrace sustainable fashion with handmade textile jewellery.